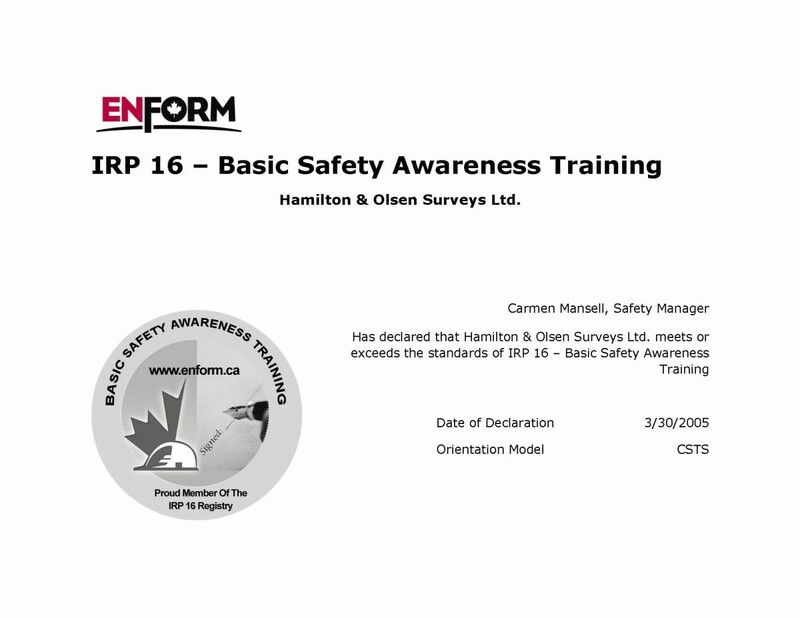 Safety – Hamilton & Olsen Surveys Ltd.
Hamilton & Olsen Surveys is committed to providing a work environment that promotes the Health and Safety of it’s employees. A dynamic Safety Program, a full time Safety Advisor (NCSO) and a Corporate commitment to Safety provide the framework for a Safe Work Environment. Safety Training, Daily Job Hazard Assessments, Safety Meetings, Safe Work Procedures, Job Observations, Safety Inspections, and Incident/Accident Reports provide the basis of the Safety Policy. Personnel Commitment, Drug and Alcohol Zero Tolerance Policy, a Work Safe Incentive Program and Personal Protective Equipment assistance is ensuring we have a competent and productive workforce that are Safety Compliant. 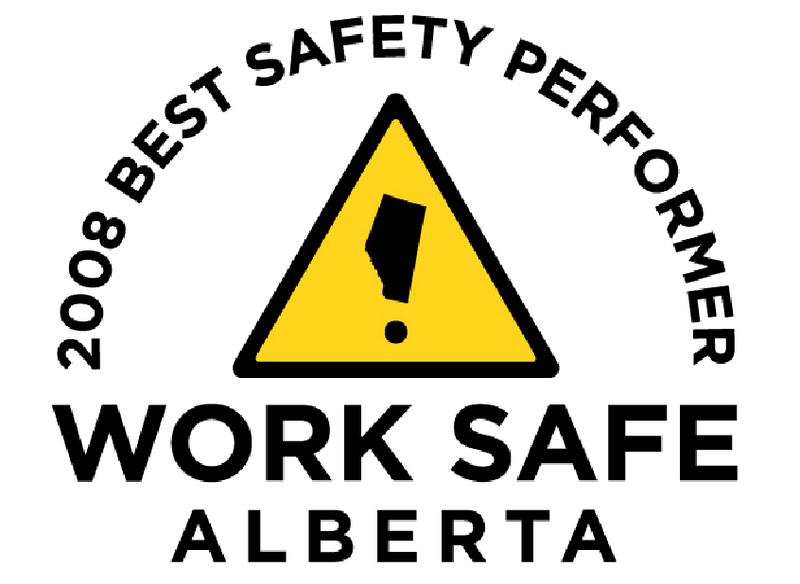 The achievement of a Certificate of Recognition (COR) from Alberta Employment and Immigration in 1998 marked the beginning of our current Safety Program. This program has evolved and adapted to fulfill Corporate, Industry and Legislative safety requirements. Hamilton & Olsen Surveys is a member of the Partners for Injury Reduction Program (PIR), the CanQual and the ComplyWorks Registries. We hold Certifications for Industry Recommended Practices (IRP 16) and Petroleum Oriented Safety Training (POST). We are proud to be part of these initiatives and have found participation to be rewarding, as evidenced by reductions in safety related incidents. 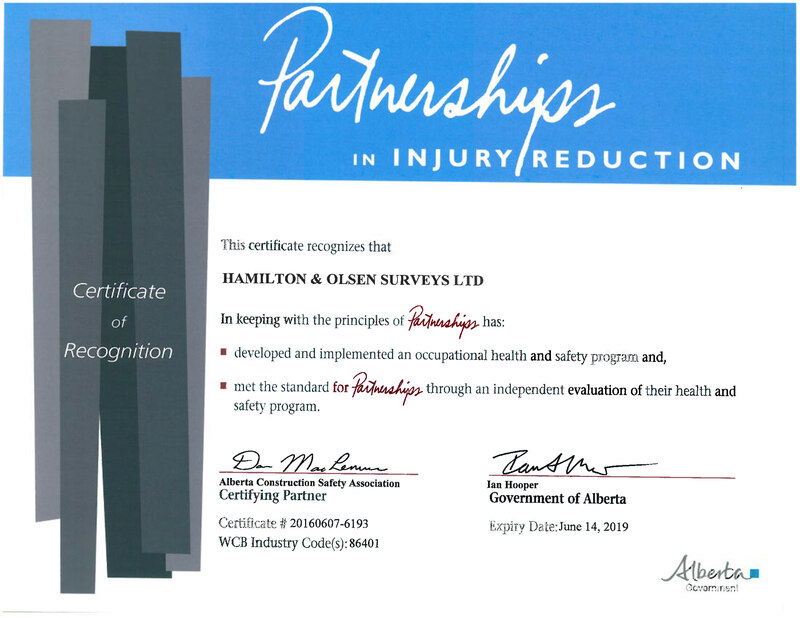 Hamilton & Olsen Surveys Ltd. was selected for the Work Safe Alberta 2008 Best Safety Performer Award for exceptional performance in workplace health and safety. Of Alberta’s 160,000 employers, approximately 700 earned this award. We value our employees and their families and we feel our goal of “ Zero Accidents or Incidents “ communicates the commitment of both our staff and our management to a Safe Workplace. Additional details of our Safety Program are available from our Safety Manager.